Powerful writing about a palpable evil distinguishes Edgar, Anthony and Shamus award-winner Riordan's fourth Tres Navarre novel. 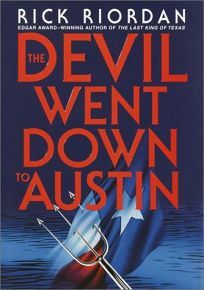 The tough, wisecracking PI and English professor moves himself and the action from his San Antonio base to Austin, where he expects simply to teach University of Texas students and visit with his brother, Garrett. But instead of tackling Beowulf he must tackle a different quest, a different monster. Garrett, software genius and free spirit, has launched a startup company called Techsan Security Software, with his friend Jimmy and Jimmy's wife as partners. Enter a truly nasty character who devours startup companies like Techsan, leaving a trail of ruined or dead owners in his wake. Techsan's brilliant beginnings lead to a takeover offer, while the offer's rejection leads to troubles that threaten to destroy the company and the Navarre family ranch, which Garrett has used as security. Soon one of Garrett's partners is dead, Garrett's the prime suspect and Tres is digging desperately for any foothold that will keep his brother from jail. An extremely skillful writer, Riordan manages a complicated plot without losing narrative force. Even the potentially distracting use of periodic asides, in the form of e-mails from the killer about his past crimes, serves to heighten tension and provide a focus for the reader. Then there's the spectacular, unforgettable description of a dive into a preserved pecan orchard at the bottom of a man-made lake. Some blatant misdirection may disgruntle certain readers, but this is a mere quibble with a book sure to enhance the author's solid reputation. (June 5) Forecast: Backed by blurbs from Dennis Lehane, Tami Hoag and Harlan Coben, this book is a dead cert for genre bestseller lists.